Labour of Love displays a collection of ethnographic artifacts which document the history of Palestinian dresses and their accessories. The collection, borrowed from the Birzeit University Museum, includes special dresses which date back to the 1940s from Bedouin communities, Beit Dajan, Hebron, and other locales in Palestine. 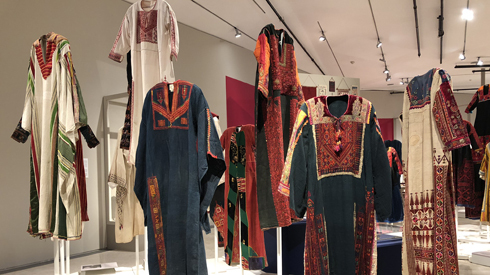 The collection of Palestinian dresses from the Birzeit University Museum is particularly important, as it is complemented with Tawfiq Kanaan’s collection of Palestinian amulets and phylacteries, also owned by the University. All of these artifacts represent a major source of reference to the academic studies and interpretations of the symbols revolving around Palestinian dresses’ embroidery patterns. Furthermore, the dresses inspire quality art exhibitions on the history of Palestinian embroidery and dresses from critical perspective, including Beyond Aesthetics, 2011 and The Ceremonial Vniform, 2014, curated by Designer Omar Bin Dina. With artist Vera Tamari, Founder of Birzeit University Museum, and Bahaa Al-Ju’ba, Registrar at the Palestinian Museum, we will learn about the unique experience of collecting important museum objects for an academic institution such as Birzeit University. We will tour the Labour of Love exhibit and contemplate the distinguished pieces on display. The conversation will focus on the history of every piece and their presence in the art exhibitions organised by Birzeit University Museum, allowing us to usher in a presentation of the experience of presence revolving around Palestinian dresses in a critical artistic context.